If you want to make cheap conference calls in Australia or New Zealand (or call any international conference participants), look no further. This is the most affordable and best value for money audio conference facility available in Australia and New Zealand today. There is no software or hardware required to install. If you can read this page you can make high quality audio conference calls. Our audio conference centre puts you in complete control of your virtual meetings, bringing your conference call participants in Australia or overseas into an interactive meeting room over the Internet. You can enjoy "Hi-Fi" sound quality conference calls at cheap rates without any investment on software or hardware. All telephone calls are mixed on our servers hosted on high speed network. Your audio conference session can be recorded for a flat $15 fee(simply email us to request conference recording 24 hours before the conference starts if you need it). Typically other conference call providers charge $0.30 ~ $0.50 per minute rate on conference call and you pay close to $50 for a 30-minute conference call with 5~10 participants. 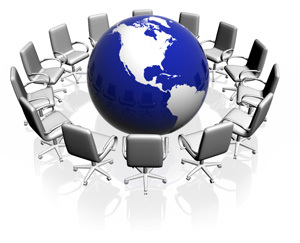 We provide this high quality conference call service to you at less than one tenth of that cost. And we are proud to claim that the conference call quality is even better than PSTN phone calls. This is by far the best value audio conference call service available in Australia ! Log into the ClicknCall website with your username password, click on "Conference Call" on the left menu. You will see a frame with a "Invite" button at the end. Just click on the "invite" button and a small window will pop down allowing you to enter a phone number you like to call. You can click on the "invite" button and call as many people as you like and bring them into your conference. You will see all the conference call participants inside the frame and you can perform action such as "MUTE", "UNMUTE" and "KICK". As well as the ability to bring in conference call participants by calling them, your participants can dial into your conference from a regular phone. You still have full control over all your conference participants via the web conference panel. Using our audio conference centre call facility, a typical 10 users conference call will cost you less than $5. This is unbeatable value! And the audio conference quality is absolutely business grade. So how much does it actually cost? Option 1): You book a conference pin and give this pin to your conference participants so everyone can dial into your conference on that particular day. Say there are 20 people dialing into your conference and your conference go for 2 hours. All it costs you is $4.95 regardless how many people dialing in and how long your conference go for. For example if you call 10 participants on their Australian landline numbers and bring them into your conference and talk for 2 hour, all it cost you is $0.1 * 10 = $1. If you call 8 participants on their Australian landline numbers and 2 participants on their mobile numbers and the conference go for 60 minutes, the total cost will be $0.1 * 8 persons + $0.15 * 2 persons * 60 minutes = $18.8.